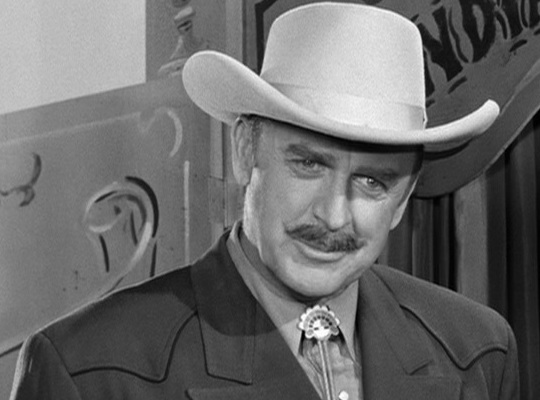 John Dehner, shown here in a 1963 Andy Griffith Show episode, was no stranger to cowboy hats, appearing dozens of times on both the TV and radio versions of Gunsmoke, among other 1950s and ’60s series. As radio’s “Frontier Gentleman,” he starred as a London Times newspaper reporter. In the 1958 series “Frontier Gentleman,” radio drama brought a cultured London Times correspondent to the American West of the 1870s — and in the process explored ethics, bravery, style, humor and a sense of adventure that might be hoped for in professional journalists in any century. John Dehner, a character actor in films, radio and television since the 1940s, starred in the weekly CBS adult Western as J.B. Kendall, who may have looked (or sounded) like a city dude, but proved to be a man of action. In the 41 available episodes, Kendall meets newsmakers like Jesse James, Calamity Jane and Wild Bill Hickok, among others. He hopes to interview George Armstrong Custer and Sitting Bull, but with less success. From the scripts and acting to the cinematic musical score, Frontier Gentleman was an example of mature state-of-the-art radio storytelling just before American radio drama as a genre disappeared in the glare of television. The Times did have the biggest news out of Montana in July 1876, the same period as the fictional J.B. Kendall’s adventures, but not with an on-the-scene reporter. Bylined “From Our American Correspondent” and datelined Philadelphia, the story’s lead was “The Custer massacre in the Indian country has caused a thrill of horror…” Perhaps further exploration of the paper’s archives could uncover a roving reporter in the West, but he would be hard-pressed to match Kendall’s accomplishments. Each episode — most of them written by series creator and director Antony Ellis — had narration by Kendall woven through the dialogue. He interviewed Indian scouts, gun-slingers, homesteaders, gamblers, exotic women, a man who herded cats, and other colorful characters. It’s not hard to imagine the descriptive narratives in print, although they might be a bit colorful for the Times. The camaraderie between the two journalists is obvious, despite their different backgrounds — and Meeker’s hangover. Kendall: I understand you write for a newspaper… I do some correspondence myself, for The London Times. Meeker: Hey, I’m proud to meet you. Kendall: May I return the compliment? Look here, is it true what I’ve been hearing these rumors about a Sioux uprising? Kendall: Well, do you think you could find me one of those Indian scouts? 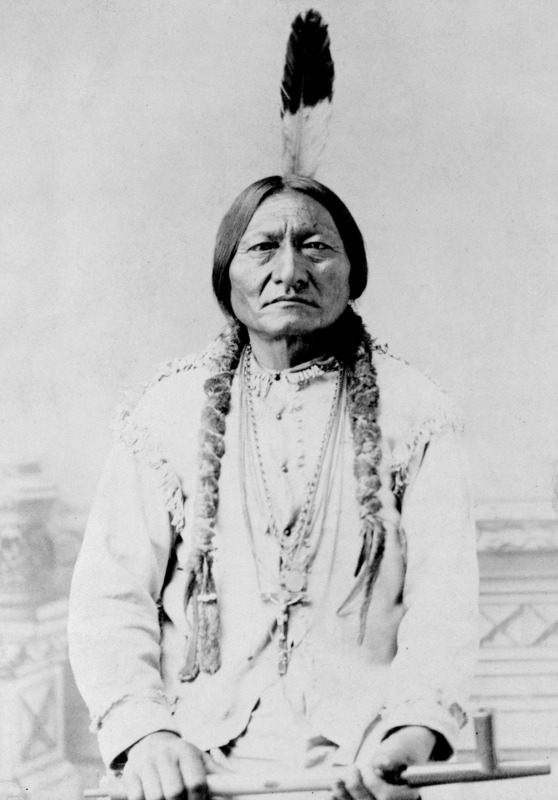 Someone to guide me to Sitting Bull’s camp? Meeker: You mean it, don’t you? Despite his protest, by evening Meeker has not only found a guide, he’s already using “we” when talking about reporting the story. And on the road, they find more camaraderie in a journalistic discussion of hangover cures, and causes. The conversation also leads Kendall to admit to having been a cavalry captain in India. The script writer was a bit heavy-handed in naming the American reporter “Meeker,” described as short, thin and round-shouldered, but the plot is about the courage of this somewhat frail and alcoholic reporter. The ending is foreshadowed, but well played. And after Meeker’s death, Kendall files a story to Meeker’s paper, as well sending his own off to London. Set in the mid-1870s, the story identifies Meeker as a correspondent for a Montana paper called the Virginia City Telegraph-News. I assume the character and paper were as fictional as Kendall, although Virginia City, the territorial capital, did have its first newspaper by then, The Montana Post, founded in August, 1864. Today’s Virginia City local newspaper, the Madisonian, began publication in 1873. Christine Kirkham, coordinator of the Montana Digital Newspaper Project, graciously checked several databases for me, discovering only one paper with the word “Telegraph” in its title, The Walkerville Telegraph, 1891-93. Throughout the series, Kendall was portrayed as a cool-headed adventurer, a veteran of the other “Indian wars” — in India, as a British cavalry captain. His suggested cure for Meeker’s hangover involves tea, curry, ginger, sugar and a cobra’s head. Unlike Kendall, Meeker doesn’t carry a gun. But he agrees to help the Englishman try to get an interview with Chief Sitting Bull, and then — inspired by Kendall — insists on accompanying him on the assignment, rather than let the foreigner risk his life alone. The ending is foreshadowed, but well played, including a brotherhood-of-reporters theme not uncommon in popular culture portrayals of otherwise competitive correspondents. “Adult” westerns in the 1950s were not as “white-hat-good, black-hat-bad” as The Lone Ranger and other cereal-selling juvenile series. Characters could have a beer now and then, but they still couldn’t use expletives any stronger than “son of a gun!” The “Frontier Gentleman” writers clearly had fun with that in an episode titled “The Honky Tonkers,” where one character uses the phrase “son of a gun” a dozen times in the first three minutes. Adding whiskey and dance hall girls, and more son-of-a-gun foul language (with ladies present!) offends Kendal and eventually leads to a fight, a shooting, and an opportunity for Kendall to perform emergency surgery as learned on some distant battlefield. I suspect Richard Harding Davis would have been proud to have him as a colleague. Historical figures were woven into many of the plots. Kendall just misses Col. George Armstrong Custer in “Kendall’s Last Stand,” a few episodes after the Charlie Meeker story. Jesse James (“Jesse James Robs Kendall,” “Kendall Robs Jesse James”), Calamity Jane and Wild Bill Hickok (“Aces and Eights”) were among other real-life figures portrayed in the series. Thanks to the Library of Congress and university libraries’ access to digitized 19th century newspapers, students researching the series can have fun looking for accounts or actual incidents or individuals mentioned in the series — remembering that 1958 radio script writers had much more limited research resources. Here’s a Montana-newspapers search for “Sitting Bull” in the 1870s at Chronicling America. While the introduction to each episode is comparable to a newspaper’s lead paragraph (see list below), the endings sometime tell another angle that rings true — Kendall heading to the express office to see if his latest remittance check has caught up with him. Often, it hasn’t. Coincidentally, along with his scores of film, radio and TV dramatic roles, Dehner also worked in journalism. According to his Los Angeles Times obituary and a biography at the Internet Movie Database:During World War II he served as an Army publicist with Gen. George Patton in Africa and Europe, and after the war he shared in a Peabody Award that Los Angeles radio station KFWB won for coverage of the first United Nations conference. The copies linked below are from the Internet Archive collection at http://www.archive.org/details/FrontierGentleman-All41Episodes, which also includes an audition with a different actor in the leading role. The DigitalDeli radio history site offers the Definitive Frontier Gentleman Episode Guide, including thoughtful notes on the evolution of the old-time radio recording-sales business, the “otr” collecting hobby and the uneven naming of radio program episodes by collectors. Pioneer radio collector J.David Goldin provides plot summaries and cast lists in his Frontier Gentleman page at RadioGoldIndex.com. The commercial company Radio Spirits sells Frontier Gentleman box-set CD collections, with notes from radio historian Jack French. Frontier Gentleman, the first 16 episodes, February to May, 1958. Frontier Gentleman: Life and Death, 16 episodes, May 25-Sept.14 1958. For some radio series, Radio Spirits or other commercial firms have claimed to hold exclusive license from the program’s rights holders, and have convinced the Internet Archive and other online sources to “take down” free or for-sale MP3 collections posted by collectors and traders. The Radio Spirits collections, however, are of professional CD quality, not compressed MP3s, and include supplementary information, so I have requested that my university library acquire them for student use.